This is going to be a bit of a rant. I'm usually really good at picking my battles but this time, I need to write this for myself and for anyone else who may resonate with this. Besides, this is my safe space - so fair warning, if you're easily offended, it's probably best to stop right here. That being said, I do love some good banter - comments are welcome. I hope that my meaning will not be lost or misconstrued, but just in case here is a disclaimer: I do not discriminate against those who plan to pursue or are currently pursuing their studies locally, be it in national universities or private colleges. This is merely a recount of my experiences and my opinion. 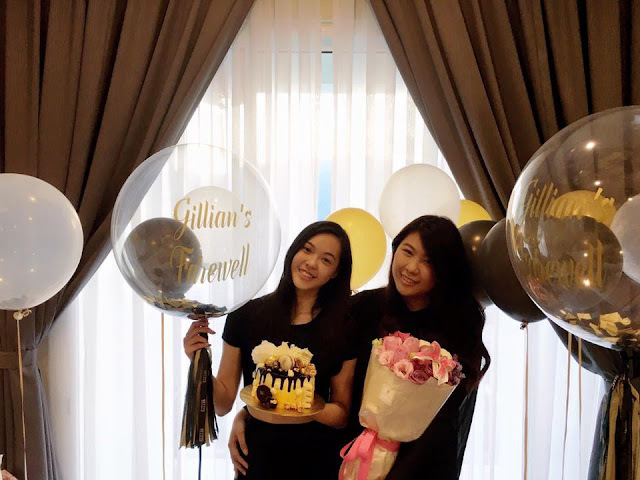 When I made my final decision to accept my offer to study in Australia, there was no fanfare, no announcement, I simply packed my bags, said my goodbyes to close friends, had a small farewell party with my family and left. You might be wondering; why did I not say anything? Truth be told, I wasn't mentally ready for the comments that would follow. Things like: 'NJHL(你就好啦)', oh, you lucky girl, Wah rich lah that's why get to study abroad! I'll be upfront about this. I never considered local(Malaysian) universities as an option, because the status quo is painfully obvious, which many have probably long been accustomed to and I was fortunate enough to have parents who were willing to pay for me to get my first tertiary qualification at a private college. I watched a friend attempt to get into local universities with her A-Levels and needless to say, she did not succeed. Another had to give up the idea of pursuing her studies locally simply because local Unis did not accept UEC results, so she took her search abroad and managed to obtain a scholarship to study here in Australia. These are just a few. Notable Malaysian talents like Dr Julian Tan and Dr Lam Shu Jie were, for the most part, rejected by Malaysian companies for scholarships and left the country to pursue their respective degrees too. But here's my real question: Why is studying abroad regarded as such a privilege and why are Malaysians who decide to leave the country regarded as liabilities? Putting aside the obvious that there are a number of costs traditionally associated with studying abroad and the fear of venturing into the unknown, I don't see where the negativity regarding leaving the country is coming from. To those that think so, I say this. Studying abroad (and wanting to migrate) does not necessarily mean I have a better life and it irks me when people think that is the case. Even for those with well-lined pockets, giving up the comforts of home can still be a struggle. Can it be considered an insult, then, by insinuating that all who study abroad are from wealthy families? Discounting the efforts of those who have studied hard to get into the university of their dreams; parents who have worked day & night and sacrificed sleep to with the desire to give their sons and daughters a good tertiary education they might not have had ; Siblings who have given up their opportunities in hopes that others in their family will have a better education and those abroad who live on a shoestring budget who are trying make every last penny count AND having to push for better grades to secure their future; or those that support themselves and have gotten here through their own hard work. What about them? A stark difference I have noticed between Malaysian & Singaporean students (at the risk of generalization) is their response to the question: Would you stay in Australia after graduation? I'll leave it to you to guess who says what, but for one party, the answer is almost always: "Yes, If I can." Sure, like many others, I left home in search of greener pastures; but please don't accuse me of turning my back on my home country, or say that I'm not brave enough to stay and fight for a better future when the system has obviously failed us. Please do not think I have my life handed to me on a platter just because I study abroad. It is an equally long and arduous journey that could probably turn out to be a failed investment and to stay, you constantly have to fight and prove your worth. In a world so fragmented and divided as it is, why create more rifts? Until we have worked to dismantle systems of injustice on our home turf, it's useless to imply that those who do not stay are somehow lesser beings and have less to contribute. Well, it's not exactly midnight, but I've decided to start journaling again. As age catches up with me, I often find myself drawing a blank trying to remember certain moments, so I've decided to gather my treasure trove of memories and put them all here, so hopefully, I'll be able to look back and remember how I felt on this very day. Knowing myself, however, it's either a struggle not to babble or I'll be left feeling like I have nothing worth writing because my thoughts are all over the place. So bear with me, I'll try to slap them into submission and I pray that my writing will be as cohesive as I'd like for it to be. It's been awhile since I've actually gotten up this early, and I'll admit that it does feel quite refreshing; watching as the sun slowly rises above the horizon. Winter break is almost drawing to an end, and I never thought I'd say this, but I really am looking forward to Semester 2 and to learning again. I probably sound like a total nerd/book snob right now. Don't get me wrong, I love breaks! They give you time to recuperate from the horrors of exam week(s), but boredom sets in fairly quickly, too. Maybe it's because I didn't plan any trips this year. I wanted to go skiing on Mount Buller but I didn't really have a budget for that. So, I decided to take up a casual planogramming job just for the heck of it and I must say, I'm enjoying it so far. Good pay is one thing, physical labor and organizing stuff is another - both help quell my restless soul but oh dear, I haven't stood for 15 hours straight since my days at Switch._. The soreness I feel right now is a reminder that I should probably get a desk job. I've actually tried that before, but I'm still unsure if that'll suit future me. I've already shot down my dreams of becoming a psychologist, but I'm still 2 semesters away from deciding what I must do with my life, so I'll leave that for later because I don't want to destroy the serenity of this beautiful morning by overthinking. One thing I've noticed - It's oddly quiet, being up at this hour. I think I haven't been up since my midnight laundry runs back at Logan. I don't really have anyone to talk to because most people I know are still in bed, and since the move, I haven't kept in touch with anyone. Partially my fault, I guess. I just haven't put in the work in maintaining those relationships apart from a select few. Not that I mind though. I suppose as one grows older, you begin to reevaluate your circle and become a bit more picky about the people you choose to grow and surround yourself with. For me, I prioritise my happiness. Sure, it may sound like a selfish & self-centered move, but it's better for all parties that way. I can't save someone from drowning if I'm drowning too, right? Of course, I still love friends who can pick up right where we left off - If you're wondering.. you'll definately know them when you see them in my bridal party (lol). Ah, yes. I recently found out that 'gillianong.com' has finally become available and I'm thinking about a domain change. Then again, I'll have to ask myself, is it really worth it? 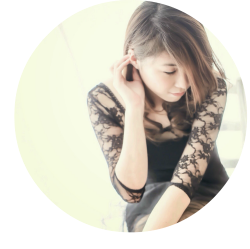 I also did think about retiring this blog, but I decided to revamp it instead. My readership has in fact, dwindled over my hiatus and I suppose people aren't into long, lengthy content like this anymore (I'm judging based on those 'bite sized 1 minute videos' you see on Facebook recommending cafes & unique places to visit etc). Granted, I should probably venture into Youtubing but something about it just doesn't jive with my personality. I'm already a little cringey about showing my face on Facebook live/Instastories so maybe in a couple more months, we'll see. Well, I'd better wrap it up before you guys start dozing off! Time to grab breakfast and some coffee before work. 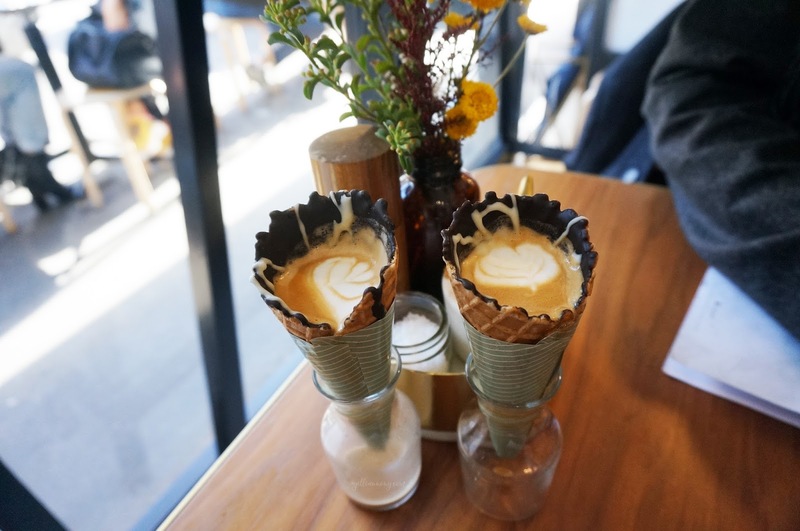 When I first heard about 'Coffee in a Cone back' in 2016, I thought to myself that it wouldn't be long before it came to Melbourne. I suppose I was right, but it took a year!! 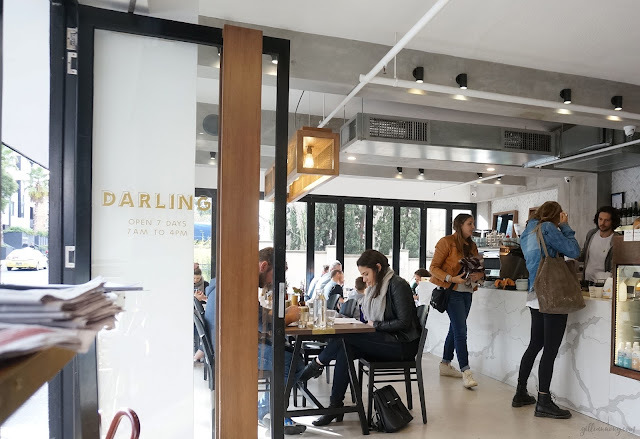 So when it was available here in Australia, Tjun & I jumped at the first opportunity to check it out - at Darling Cafe in South Yarra. I absolutely adored the interior of the cafe with it's gorgeous marble front counter and floor to ceiling windows. Cafes in Melbourne are so beautiful, don't you agree? 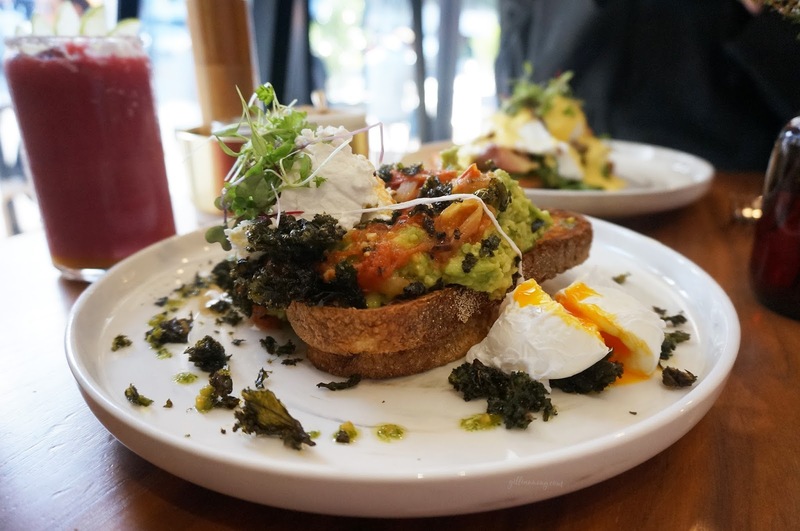 There was a bit of a wait for a table- a typical feature of the melbourne brunch scene, which often makes one feel a bit apprehensive.. but it was well worth it. Service was great from the moment we stepped in, staff were calm & collected even though it was a rather busy period. As always, coffee first : Some messiness aside, I did enjoy the coffee in a cone. From my understanding the chocolate was to prevent leaks, though it didn't seem to work too well. Still, it was tasty. The cafe did have quite an extensive menu, so we were absolutely spoilt for choice. I was pleased to see elements of Asian cuisine included under 'The Wok', and was seriously tempted to try their waffles topped with fairy floss, but it just seemed a little over the top for brunch. In the end, we settled for some savory items from the breakfast section. I'm sure most of you would agree when I say shopping for Father's Day gifts are hard! I mean, what do you get for the man who raised you or the father of your child when they insist that they need nothing more because they're such strong advocators of not purchasing anything new unless it's absolutely essential? Well, this year..you won't need to get them "#1 Dad" coffee mugs, neckties or socks anymore, (yay!) because really, what better gift is there than showering them with love every month? Wondering what I mean? Read on! Even as children, I'm sure we've all had our visions about THE perfect wedding, and as I take a step closer into turning that dream into reality, it becomes clearer that it isn't all fun & games. As friends around me tie the knot; and with each wedding inspiration post that I pin, I've begun to realise that there really is a lot of sweat and tears involved along each step of the way. After binge-watching many episodes of 'say yes to the dress', I thought I'd had the 'formula' to choosing the perfect gown down pat. Boy, was I wrong! I tagged along with some other brides-to-be to their various dress fittings previously and I'd never seen anything that particularly caught my eye. Typical of me, really. And you know what else came as a shock to me? The prices! Not particularly pocket-friendly, given that most of them are just available as rentals. 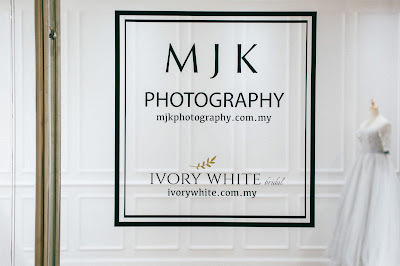 So when Mel extended an invitation to view some gowns at her new business venture - a Bridal Studio - Ivory White, located along Jalan Kuching, I gladly accepted. With the help of her very specific directions, we managed to find the place easily. 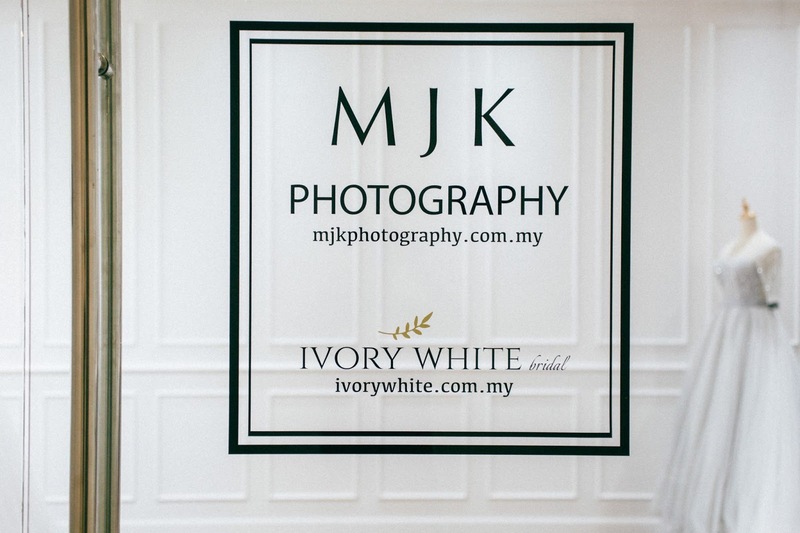 Mel's husband, Jason of MJK Photography also does wedding photography. I'd always enjoyed our little trips together, conquering one destination at a time. The both of us hadn't set foot in Langkawi since we were kids. So, when we were planning our next getaway, it seemed like the most obvious choice. After doing some research, we decided against renting a car in Langkawi and opted for a 'RoRo' (Roll on Roll Off Ferry) service by Langkawi Auto Express instead. Honestly, if you don't mind the drive (the ferry departs from Kuala Perlis), I would recommend it. 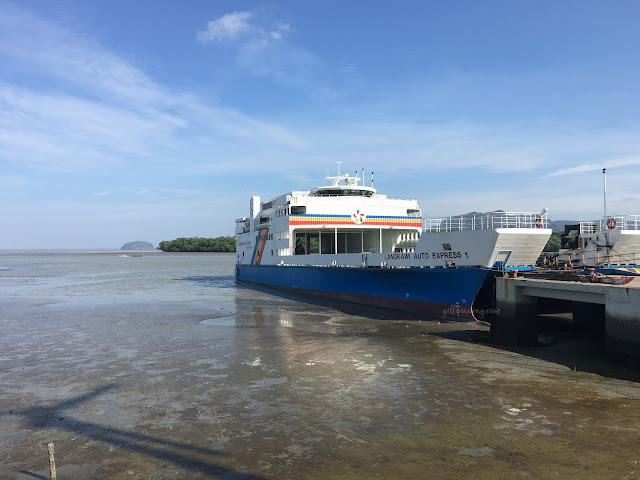 For those that are familiar with the ferry service from Penang Island to Butterworth, I'd say it's pretty much the same thing except that it takes longer, of course. We set off from Penang in the morning and took the 1-hour drive to Kuala Perlis Jetty. We had to check in an hour early before the departure time (very much like a flight, yes), so we ended up having brunch at a Malay restaurant nearby and joined the queue of cars waiting. We noticed that there were some passengers who opted to stay in their vehicles, but it was a 2-hour ride, so we decided to explore the vessel since it was our first experience. The middle decks were meant for passengers - both air-conditioned with ample seats and movie screenings along with refreshment booths and of course, washrooms. I didn't really like the enclosed space as it made me feel rather seasick, so we spent most of our time on the upper deck, enjoying the breeze and the view as we slowly made our way towards Langkawi. We were meant to stay at D'coconut Hill Resort on Gunung Raya, but after reading some reviews that it was haunted etc, we decided against it (better safe than sorry, guys). 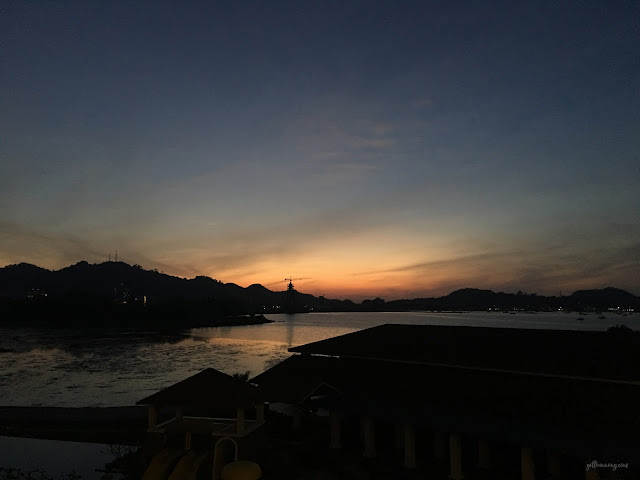 Instead, I booked us in at Dayang Bay Serviced Apartments , as it was really hard to find a place that wasn't full as it was still peak season(CNY) and we only decided on this trip weeks before. Still, the room was spacious and we had no complaints. We decided to unwind and enjoyed a couple's massage at Danai Spa before heading to Pantai Cenang. After wandering around, we decided on Putumayo for dinner as the other places were pretty full, and we managed to get a table after a short 10-minute wait. Prices were a little dear by local standards, but we enjoyed our butter garlic lobster and mango chicken. YUMM. We wandered along the beach town, soaking in the sights & sounds, exploring the local shops & stores until we got tired and left for the hotel. Determined to make the most of our day, we got up early to catch the sunrise and headed downstairs for free breakfast. 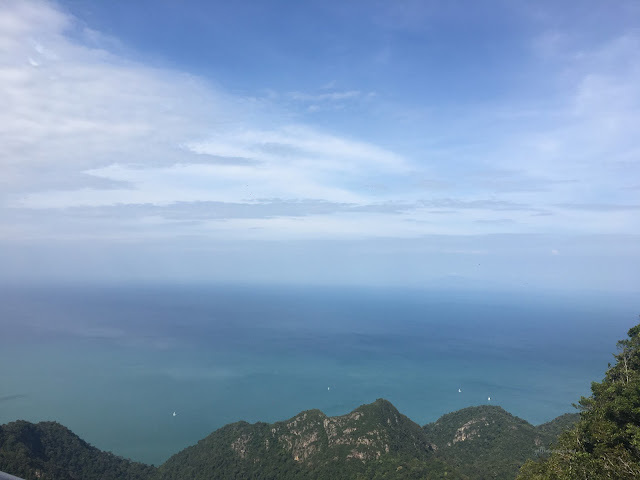 We were going to visit the Langkawi SkyBridge and as there were a number of things to do, we decided that getting there early would ensure that we would have plenty of time to explore. 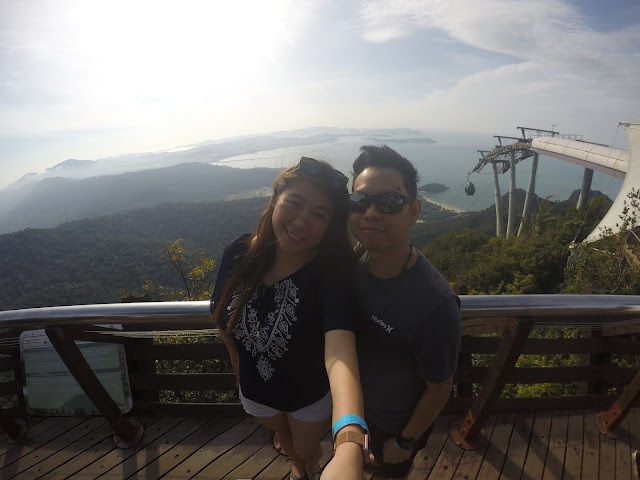 We opted for a glass bottom gondola(RM105 per pax) so we could enjoy the view. The ride up was segmented into three parts, so we spent some time wandering around & of course, taking photos. Gorgeous view of the Andaman sea. Imagine our smug smiles when we saw the crowd queuing up for tickets! Guess getting up early wasn't so bad after all. We did have a quick walk through in the 3D museum, and it was pretty interesting, but we didn't bother with the rest of the attractions as the wait times were too long and left to visit Tanjung Rhu Beach instead. I was surprised at how clear the water was. This trip really changed my perspective of Malaysian islands. Mike was really craving for some good local fare, so I searched foursquare and found Kak Yan Nasi Campur in Kuah, and we made our way there. There was quite a crowd, but we still got there early before a busload of tourists arrived. Guess we got lucky(again!). After bumming out at the hotel spa for some R&R, we headed back to Pantai Cenang to meet up with Mike's friend at Nest Rooftop Bar. We ordered a couple dishes and drinks to share and watched the sunset. Eventually, we got bored and decided to walk along the beach and went bar hopping. One worth mentioning was thirstday. The kitchen was still open, which was a plesant surprise, so we ordered a couple beers and pizzas to share to end the night. It was the day of our departure, but we knew that we had to visit the famous Yellow Cafe before leaving. I ordered a steak with french butter, while Mike had (what looks like) lamb skewers. After lunch, we headed to the Tanjung Lembing port where we boarded the ferry and left for Penang. Ah, yes. I felt like my 'atas' meal with a view deserved some screen time. We had such a wonderful time, even though it seemed like we didn't do much; but sometimes, when you're in a long distance relationship, the mere presence of your other half is more than enough. Still, I hope to return again as there is so much we have yet to explore. For Michael's 'Engagementcation'(as I like to call it - because he always says he flew down to Melbourne just to get engaged), we rented a car from Carhood. I thought it was great value for money, a Ford Fiesta for $24 per day. I do think it's the perfect choice for travelers coming from interstate or international destinations, but not so much for those already in the city as you have to pick up the vehicle from Melbourne airport, but I digress. I'd already been to Great Ocean Road once with my family on a one day trip and to me, it was a fairly easy drive. This time round, however, our trip did not really start out as planned. Heavy rains over the past week caused floods and landslides, so the coastal road was closed. We were debating canceling the trip, but we decided to take the advice of a family friend and pressed on. It took us about 2 hours to get to Geelong, where we made a pit stop at Freckleduck for coffee. Coffee was decent, and I absolutely loved the bare brick walls. From then on, we took turns driving towards Apollo Bay, but as I mentioned before, a good part of GOR was closed, so we took the inland route. From experience, I knew that we were missing out on a good part of the scenic route, but we consoled ourselves with the fact that we could always visit again. It was another 1.5 hours before we arrived at Skenes Creek where we decided to stretch our legs for a bit at the beach. Ah, those overcast skies were a foreshadowing that we wouldn't be able to see the Milky Way. We booked an Ocean View Studio, and the view did not disappoint. We knew that we'd be provided with a barbecue grill and packed for the trip, but we were still a few items short, so we took a short drive to Foodworks in Apollo Bay to pick up some extra vegetables and wine. We made ourselves a hearty dinner and sat on the porch, stargazing. We were also provided with a telescope, so we set it up and watched the moon. We left the blinds open the night before and awoke to a gorgeous sunrise. What would I give to wake up to this view every day..
We bundled up and took a short morning stroll along the beach, right opposite the lodge. After checking out and saying goodbye to the sheep and alpacas(I insisted! ), we had brunch at The Bay Leaf before heading towards the 12 Apostles. From Apollo Bay, it's a 1-hour drive to Port Cambell National Park. It seemed that the road closure did little to deter all the other tourists from visiting - the place was absolutely packed! We left for home after that as we were pretty pressed for time - Mike was due back in Malaysia the day after. Still, we had an amazing time just taking in the sights and enjoying each other's company. Also, our stay at Seafarers Getaway was absolutely delightful, I can't recommend the place highly enough! I cannot wait to visit again because I know each visit will bring something different, and there's just something about road tripping and being constantly surrounded by beautiful landscapes that just makes you yearn for more.